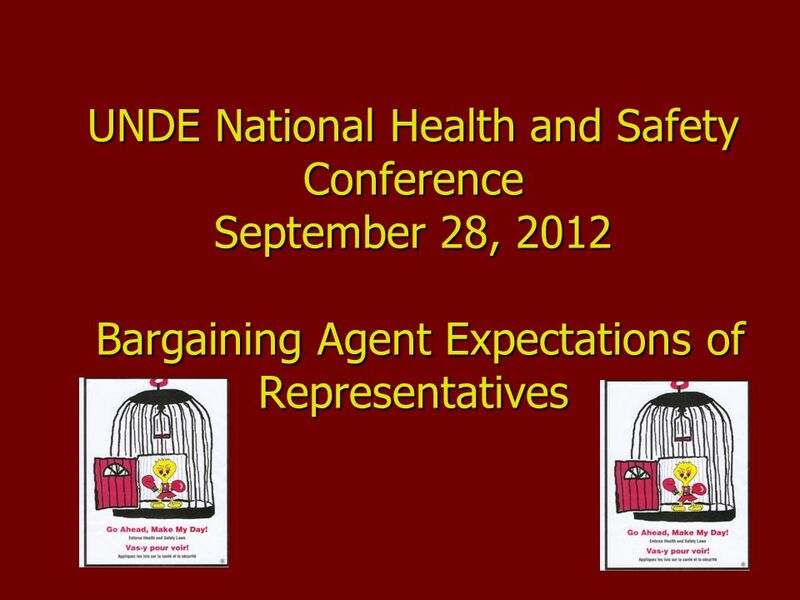 UNDE National Health and Safety Conference September 28, 2012 Bargaining Agent Expectations of Representatives. 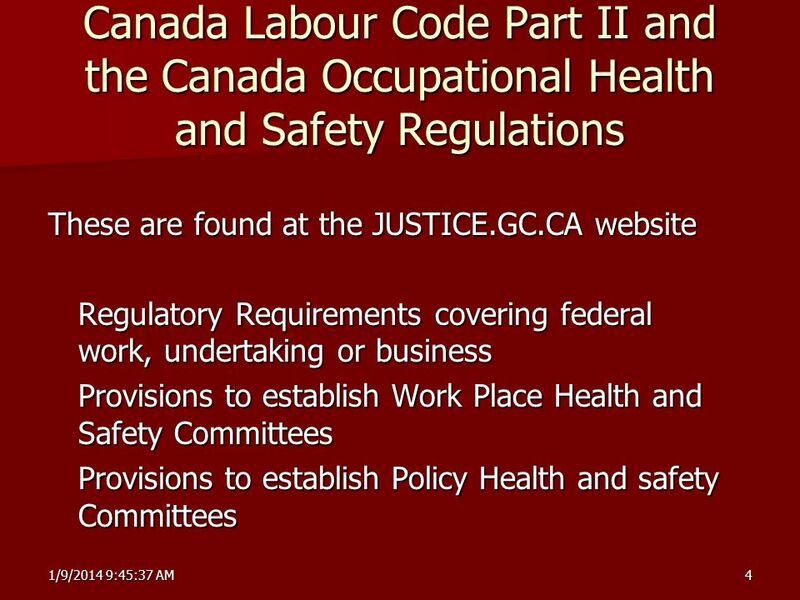 2 Overall Objective To be an effective and informed advocate for our members and to ensure the employer is carrying out their duties under the Canada Labour Code and Regulations. 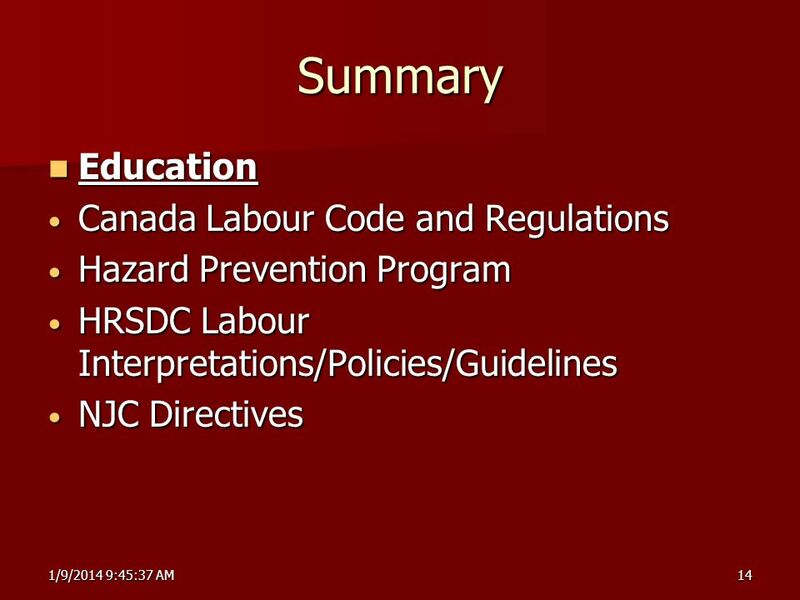 To be an effective and informed advocate for our members and to ensure the employer is carrying out their duties under the Canada Labour Code and Regulations. 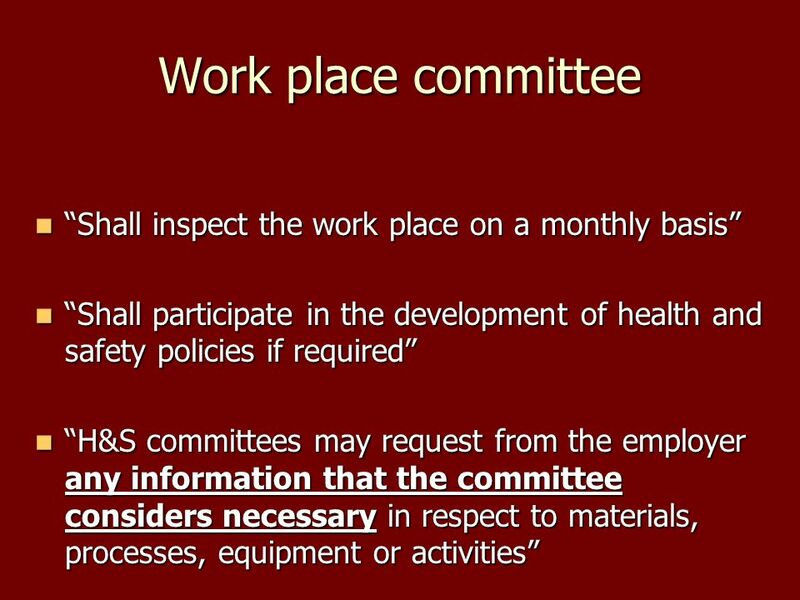 3 What is a Work Place Health and Safety Committee? 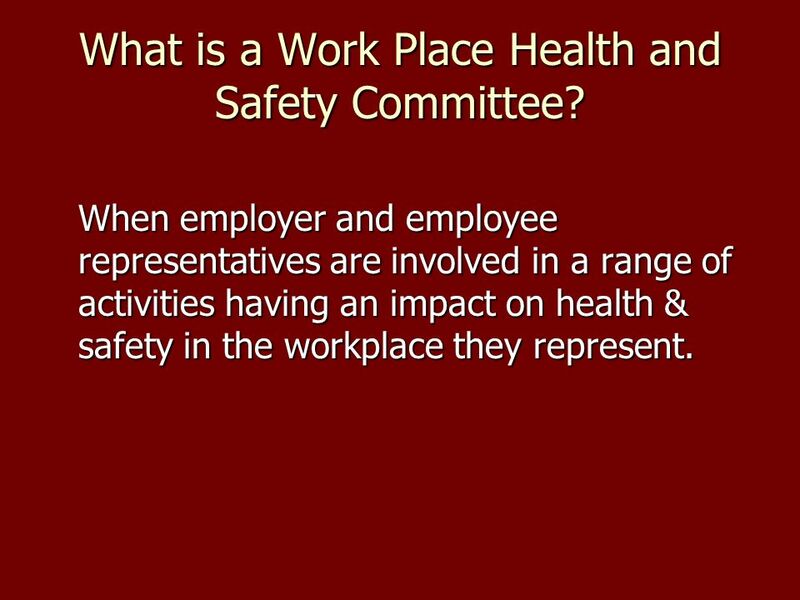 When employer and employee representatives are involved in a range of activities having an impact on health & safety in the workplace they represent. 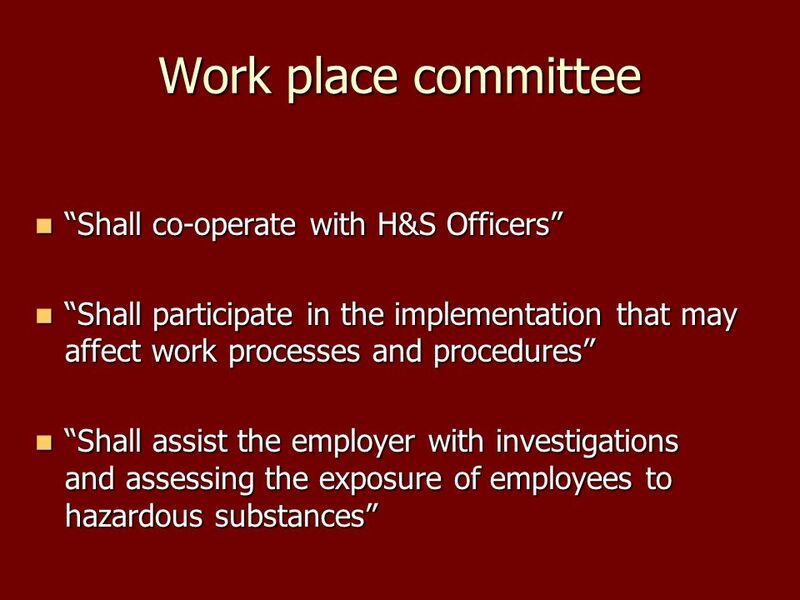 When employer and employee representatives are involved in a range of activities having an impact on health & safety in the workplace they represent. 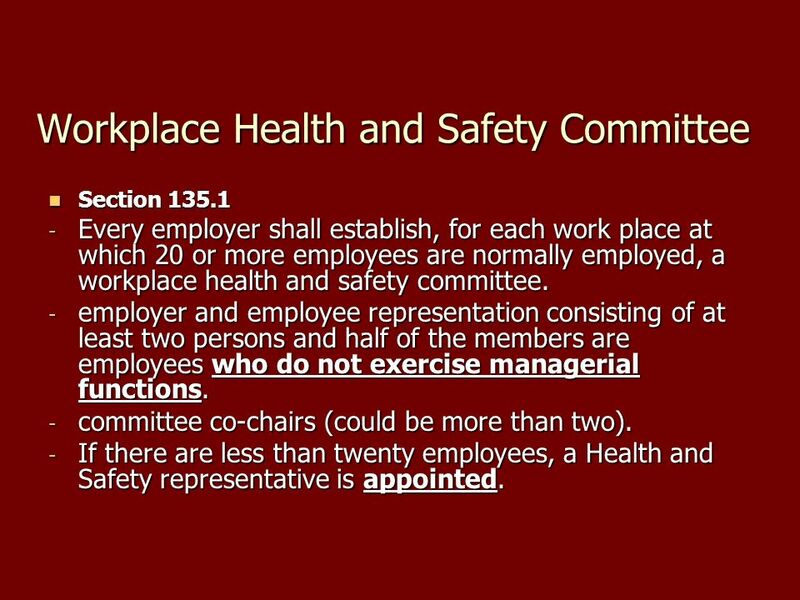 5 Workplace Health and Safety Committee Section 135.1 Section 135.1 - Every employer shall establish, for each work place at which 20 or more employees are normally employed, a workplace health and safety committee. - employer and employee representation consisting of at least two persons and half of the members are employees who do not exercise managerial functions. - committee co-chairs (could be more than two). - If there are less than twenty employees, a Health and Safety representative is appointed. 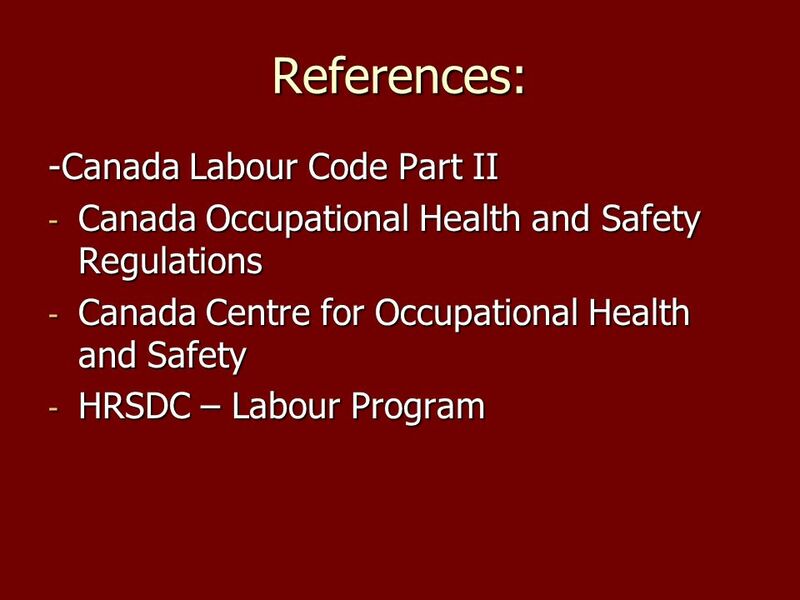 6 Canada Labour Code Part II (Policy Health and Safety Committee.) 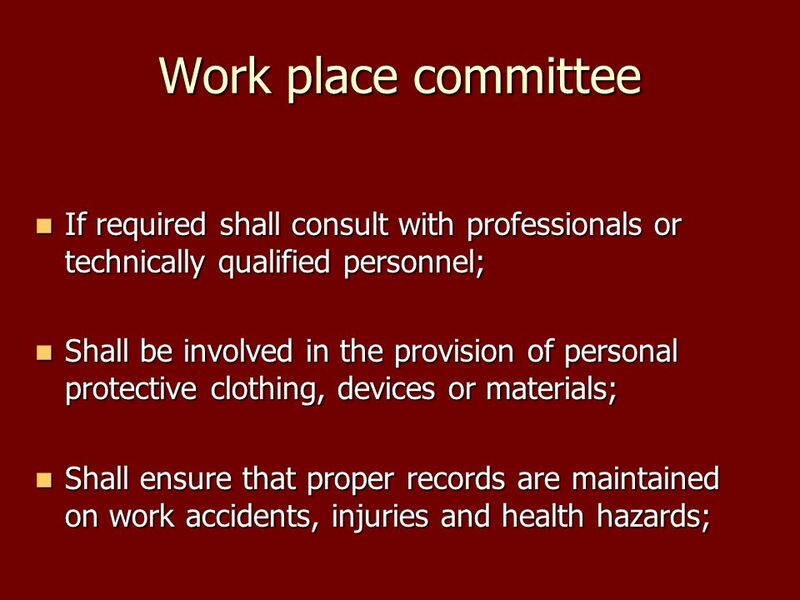 - Every employer who normally employs directly 300 or more employees shall establish a policy health and safety committee. - Management and employee representatives. - Bargaining agents select their representatives. - Two Co-chairs appointed. 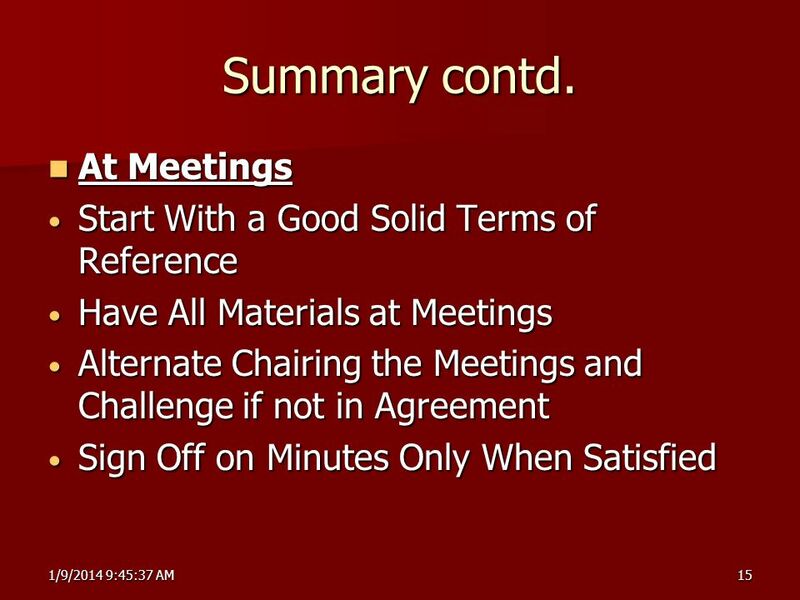 - Records of meetings. - Meetings held quarterly. 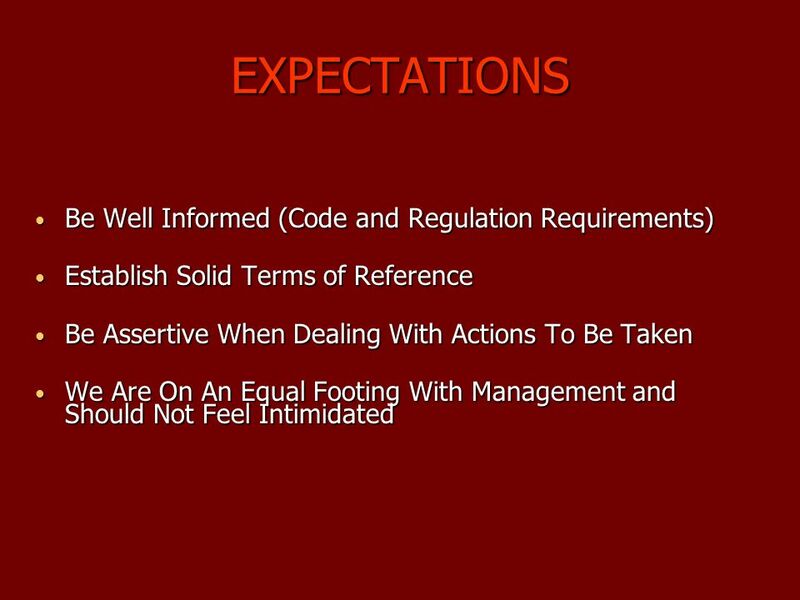 Download ppt "UNDE National Health and Safety Conference September 28, 2012 Bargaining Agent Expectations of Representatives." SESSION 8 TITLE 4 – HEALTH PROTECTION, MEDICAL CARE,WELFARE AND SOCIAL SECURITY PROTECTION. 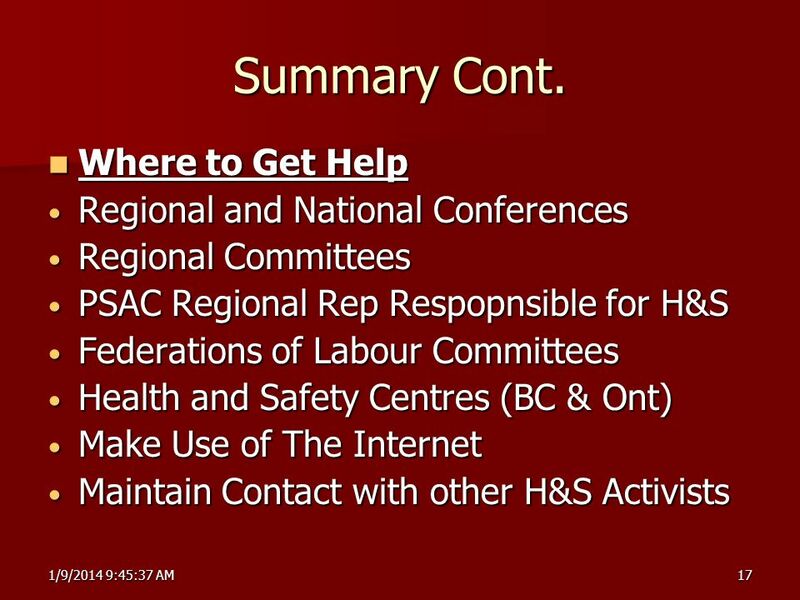 Health and Safety Committees RENZO BERTOLINI Canadian Centre for Occupational Health and Safety. 2 3 There are two basic areas where there is a need to have resources available. Internal:  Financial  Personnel  Assets  Time External  Consultants. 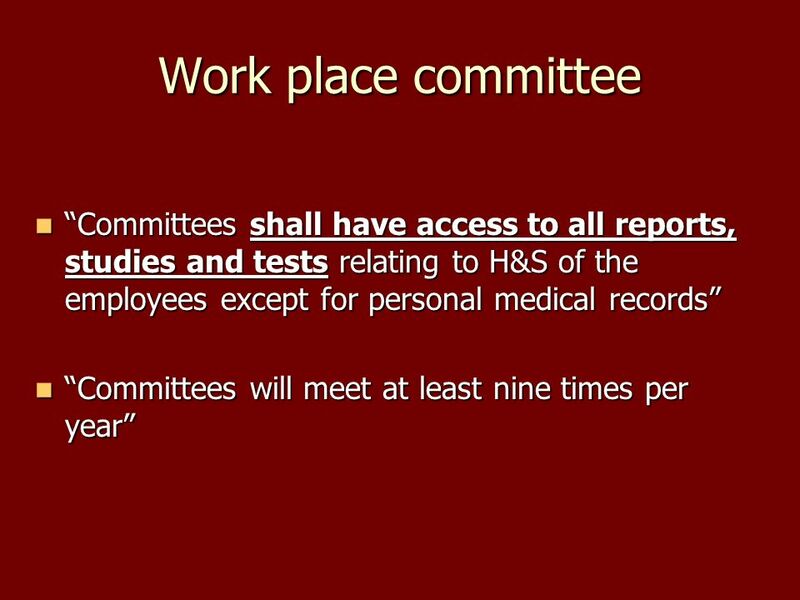 NSW Work Health & Safety Act Module: H&S Committees – Roles and Functions 1. 1 POINTS OF LAW NEEDLESTICK INJURIES CONFERENCE 2006 Dr Kieran Doran P J O’Driscoll & Sons Solicitors 73 South Mall Cork City. 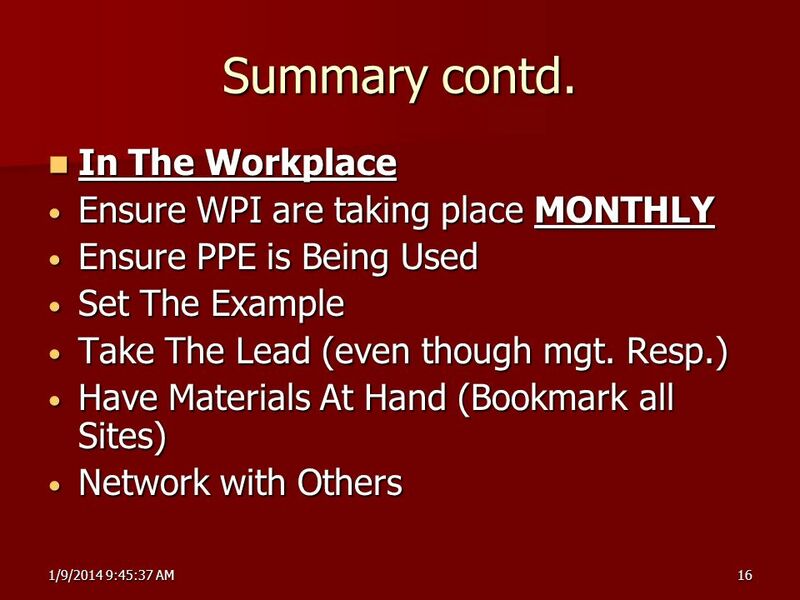 February, 2010 Workplace Violence Module 2 – Follow-up, Rules and Resources. 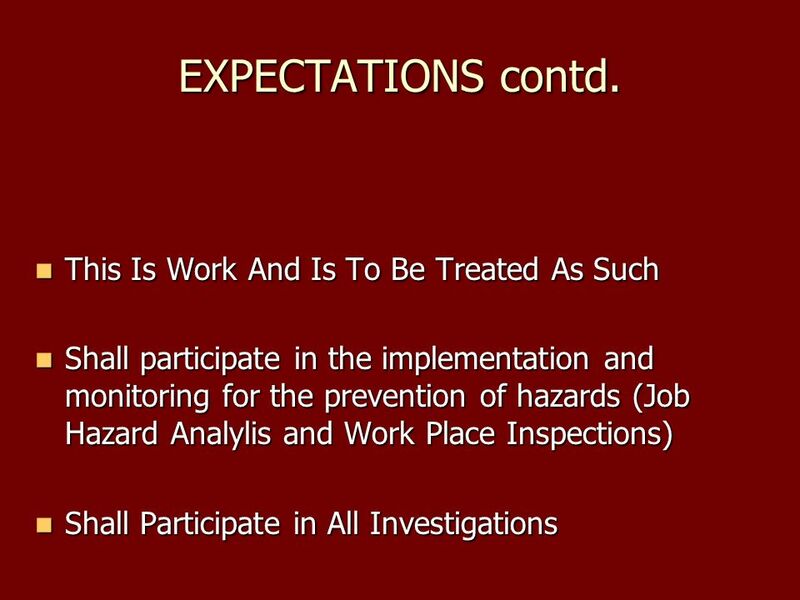 IAEA International Atomic Energy Agency Responsibility for Radiation Safety Day 8 – Lecture 4. Welcome To The Joint Occupational Health And Safety Committee Appointments 2013 Course 1 Presented By The BCGEU.